Hey, Im Lynda! 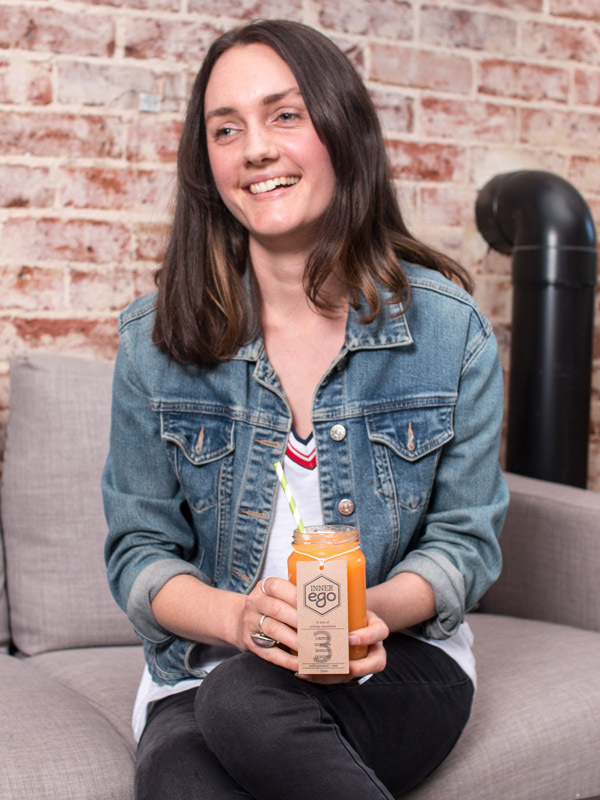 I started Inner Ego in late 2013 with a passion for healthy living, eating and of course great cold-pressed juice. I wanted to help people reap the benefits of plant based eating and juice cleansing, without the hassle of having to prepare it themselves. Plant based eating is so much more than just a boring salad, and plants can really transform your health and wellbeing. At our kitchen we craft juice, food and almond milk that is fresh and of the highest quality, we never cut corners! We work with local suppliers, farmers and business who have the same passion for food as us. Cold Press - Why is it Better? Traditional blending or grinding exposes the juice to heat, which can oxidise the juice destroying flavour and its nutritional benefits. Our slow moving gear juicer applies pressure on the fruit, vegetables and nuts we use for our juices. This "cold" process means the essential vitamins, proteins, enzymes and minerals are maintained. Our product is also raw, as we do not heat treat, or pressure treat the juice after it is made, which again aids in maintain the nutritional density of the juice. Our focus had always been on small batch production, we make our juices fresh to order just for you that way you can be assured you are getting the very freshest juice possible. We use the worlds best hydraulic cold press technology slowly pressing the produce avoid excess exposure to heat and oxygen. AND we bottle, label, pack and store your juices in a 4 degree room. The lower the temperature the safer the product, the better the flavour and the more nutritionally dense the juices are! All our juices are 100% raw. We never heat treat or HPP our juice, and thus avoid destroying valuable nutrients and enzymes. We aim to provide you juices and almond milks that are full of plant based clean energy and nutrition. Mother Nature is smart and powerful, and we believe she knows best. We choose to use glass for all our juices and almond milks, as it provides a safer and nil chemical burden to your juices. We heat sterilise all our jars and then pre-cool before filling – plastic is commonly sterilised using spray on no rinse chemicals or not sterilised at all! We believe in a happy planet for all its inhabitants. None of our juices or milks contain animal products, or by products, not even Honey! Our purpose built facility works in a completely dairy and meat free environment. We strive to avoid contribution to the burden placed upon the environment in any way we can. GLASS JARS – Made from sand, our glass jars are infinitely reusable. Use them from spices, smoothies, vases and whatever else you can dream up. And if not return them to us for sterilization and re-use. BIO-PACK – All our food is packaged in BIO-Pak , containers made from sugar cane pulp.It is 100% bio-degradeable, and beats plastic anyday. SWING TAGS- All our swing tags and printing is on paper made from 100% recycled sources and is food grade! We encourage you to recycle all your swing tags, or return them for future use. Using swing tags allows us to easily recycle our bottles with minimal water use! COOLER BAGS – We use a hessian and cotton cooler bag which allows for greater re-use than boxes! And you can return your empty bags for us to refill on your next cleanse date. STRAWS – We use 100% bio-degradable paper straws- we never use plastic. MADE TO ORDER – We make to order, and as such we keep waste to its absolute minimum! FRUIT and VEGE PULP WASTE- Our leftover fruit and vege pulp waste is bagged up for use as DOG food! Giving them shiny coats and happy tummies. PACKAGING RETURN – All our packaging is returnable, boxes, packing paper, jars and swing tags. If you want to return we will gladly accept and reuse. SOLAR – Our facility uses Solar Panel to power our whole warehouse and kitchen!